Make Them Think You've Left the Country! Are you fed up with the phone calls? The constant "chance" meetings? Do you want to finish things once and for all? Now you can. 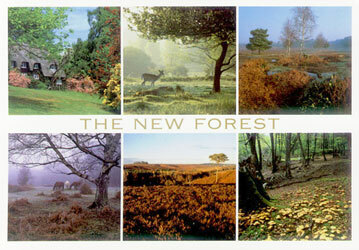 All you have to do is order one of our NEW FOREST postcards and lie low for a while. For just $10 (£5 for UK destinations) we will send a postcard like this one to a recipient of your choice - anywhere in the world! Just tell us what you want written on the back, the name and address of the recipient, and that's it! We'll write it and post it immediately, giving the impression that you are definitely no longer at home to guests! No money up front! Place your order by e-mail, including all the relevant information (text, recipient name, recipient address). Before writing the card we will e-mail you the text you have requested for confirmation and approval. Once you are happy we will e-mail you a link to a secure PayPal payment area where you can pay by credit or debit card. Once payment has been made, we will mail the card! Please read and agree to our terms and conditions before ordering. Click Here to Order Your Card!